Barring some catastrophic Chris D. on-stage meltdown or a crippling slampit injury to myself, I was probably going to enjoy this show no matter what they threw up there, as the prospect of actually seeing the true, living lineup that recorded “A Minute To Pray, A Second To Die” – my favorite album of all time – was just too good to be true. And yeah, I know, I’ve certainly ranted about it enough already in preparation, so I’ll close the books on the event and say it was easily as great as I’d expected. Better, even. 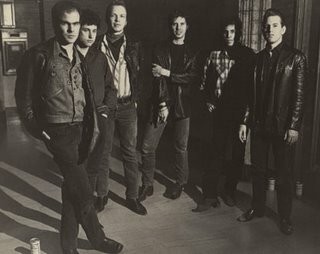 Mark Arm, bless’m, asked the 1981 line-up of the FLESH EATERS to reunite to play “All Tomorrow’s Parties” in the UK in a few weeks, as they’re one of his longtime favorites as well. They accepted, and then realized they needed to get the mojo working again after 25 years and planned a brief 3-city west coast tour. San Francisco was Wednesday; LA was last night; San Diego’s tonight. Since I never saw the original recipe band in the first place (though I’ve seen Chris D. in several Flesh Eaters incarnations, in the Divine Horsemen and in Stone By Stone), I can’t tell you how it compared to seeing this group perform back then, but based on the Target Video I’ve seen of one of their ’81 shows, this one was roughly as powerful and as raw as they were way back when. Sure, a fan always believes that when his heroes play a reunion show, but my informal post-show polling, which was uniformly positive, definitely proves that I am right. Yeah, “She’s Like Heroin To Me” is only my favorite GUN CLUB song from my favorite album of theirs (which Chris D. produced), and they did it justice for sure. I expected “Cinderella”, since that was always either the set-closer or the encore when this lineup was together in ’81. But the real “transcendent” moments were “River of Fever” and “Divine Horseman”. The band locked into both songs, both of which feature repetitive, loud riffs and a lot of space for all sorts of instrumentation (horn, marimbas etc. ), and just went off. I couldn’t wipe the stupid smile from my face the whole set. 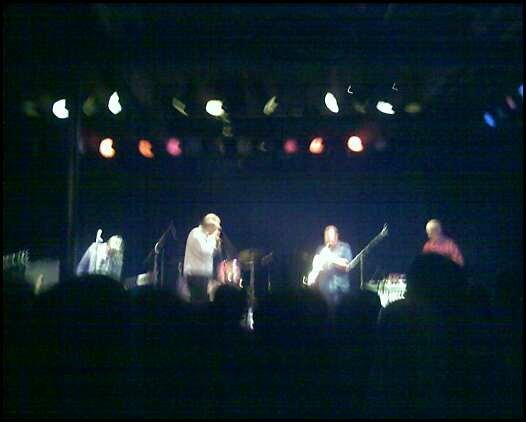 During "Divine Horseman" I took the revealing, high-resolution picture of the band with my camera phone that you see here. Oh, and it was a strong turnout as well, the lack of which had worried me a bit during the week – as much as one can be worried about utterly inconsequential matters such as turnout for a rock band – and the crowd totally lapped it up, hooting for their favorite songs from an album few bought in 1981 and which is completely out of print on both LP and CD today. It was neat. For years the FLESH EATERS fraternity had felt like a half-secret society, and once you were in, you were really in. (My cousin was a rabid fan who saw this lineup a few times in LA, and introduced me to the band as sort of a wisdom-of-the-elders rite of passage when I entered college in the town he lived in). Those who weren’t (of their own choosing) usually had seen the band live back in the day and couldn’t get a handle around Chris’ ungainly yowl of a voice, or the fact that they weren’t true punks, their metal-ish tendencies, the song lengths, or whatever. But what do I know. I turned fourteen in 1981. Anyway – there’s still time for you to hoof it to England for the final Friday, May 12th show. It’s only money, right?